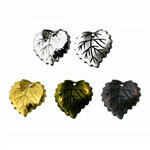 These are current production Lucite leaves with a galvanized finish. The extra cost of these leaves is due to extra manufacturing procedures. However, you'll get the look of precious metal without the precious metal price and none of the precious metal weight. The Antique leaves compliment current popular filigree and metal stamped components on the market today.